NEW YORK — Nothing kicks off the holiday season quite like the iconic Rockefeller Center Christmas Tree Lighting. Whether you're watching from home or plan to go see the spectacle in person, here's how to enjoy this annual tradition. Online stream: Watch on fuboTV. Start a free trial here. If you're in New York and willing to brave the cold, you can join thousands of other holiday revelers and watch the 86th annual Rockefeller Christmas Tree Lighting in person. Because the event is free and doesn't require a ticket, it's recommended to arrive early to make sure you get a spot. If you're busy Wednesday night, not to worry. 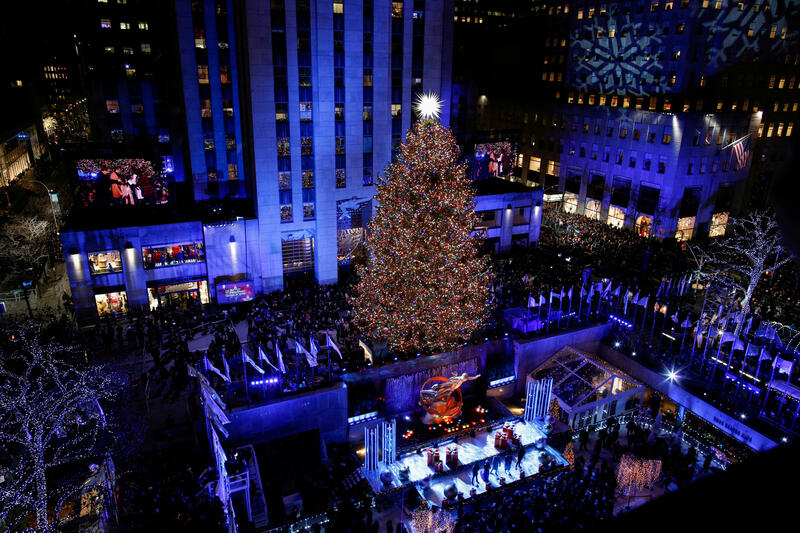 The Rockefeller Center Christmas Tree will be on display the entire holiday season. After the initial lighting Wednesday night, the tree will be lit from 5:30 a.m. until 11:30 p.m. every day through Jan. 6, 2019. On its final day, Jan. 7, the tree will be lit from 5:30 a.m. until 9 p.m.
On Christmas Day, Dec. 25, the tree will remain lit for 24 hours. Each year, a tree is traditionally donated to be displayed in Rockefeller Center. This year's tree is a 72-foot tall, 12-ton Norway Spruce that hails from Wallkill, New York, coming from the home of Shirley Figueroa and Lissette Gutierrez, two New Yorkers who recently retired from jobs in the city and moved upstate. Head Rockefeller Center gardener Erik Pauze first scouted the 75-year-old tree five years ago and his team has been preparing it for Wednesday's lighting since Nov. 8. The tree was trucked into Rockefeller Plaza on Nov. 10. The tree's topper is a 9-foot, 4-inch tall Swarovski star designed by architect Daniel Libeskind, adorned with 3 million crystals across 70 triangular spikes and backlit by LED lights. Though it was placed atop the tree on Nov. 14, it will also be lit for the first time Wednesday night. A second identical star will be on display in Rockefeller Plaza next to a Swarovski pop-up shop.